15 x 44 x 1 in. Nailya Alexander Gallery is pleased to open the new season with Irina Nakhova: Presence, on view Tuesday, September 6 through Saturday, October 1 at 41 East 57th Street, New York, NY, Suite 704. Please join us in celebrating Gallery Night at the Fuller Building with a reception Wednesday, September 14 from 6:00 – 8:00 PM. A reception with the artist will be announced at a later date. Presence is Nakhova’s third solo exhibition at Nailya Alexander Gallery, and comes on the heels of her groundbreaking installation at the Venice Biennale in 2015, where she was selected as the first female artist to represent Russia in a solo pavilion. Born in 1955 in Moscow, Nakhova was a part of what came to be known as the school of Moscow Conceptualism. In 1983, at the height of the Cold War, she pioneered a new genre with Rooms, the first “total installation” in Russian art. She gained international attention with the onset of glasnost, a period of increased openness and transparency in the Soviet Union in the late 1980s, and was one of the youngest artists to be included in the landmark Sotheby’s auction of Russian avant-garde and contemporary art in Moscow in 1988. Her first solo exhibition in the United States took place at Phyllis Kind Gallery in New York the following year. Today, Nakhova is recognized as one of the most prominent living artists coming out of Russia. Her work can be found in public and private collections throughout Europe, the United States, and Russia, including the Moscow Museum of Modern Art; the National Centre for Contemporary Arts, Moscow; and the State Tretyakov Gallery. In 2013, she was awarded the Kandinsky Prize in the category of Project of the Year, one of the highest honors in contemporary Russian art. “In the three decades since she created the Rooms, Nakhova — working in an atmosphere of vast sociopolitical change, in addition to making regular trips between Russia and the United States — has demonstrated an inexhaustible potential for formal and technological innovation and discursive reflection,” writes curator Margarita Tupitsyn in the introduction to The Green Pavilion (2015). 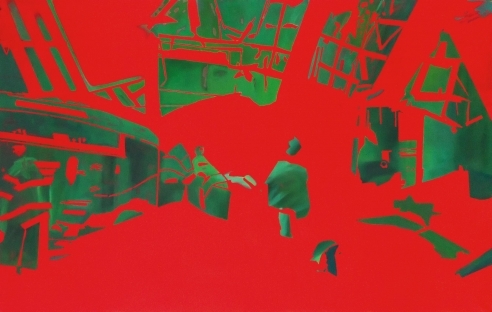 Presence features two new paintings, completed this summer, as well as seminal pieces like Mobius (1990) and Primary Colors 2 (2003), the latter of which was an inspiration for one of the rooms in the pavilion at the Venice Biennale. This exhibition coincides with the opening of the exhibition Thinking Pictures: Moscow Conceptual Art in the Dodge Collection at the Zimmerli Art Museum at Rutgers University, for which Nakhova is recreating Room No. 3, as well as with the publication of the September issue of Art + Auction, which features Nakhova as one of the year’s “25 Most Collectible Artists.” Later this year, Nakhova will have a solo exhibition at the Pushkin State Museum of Fine Arts in Moscow. Nakhova lives and works in the United States and Russia. We are excited to announce that Irina Nakhova has been selected as one of the world's top 25 Most Collectible Conceptual Artists in the September issue of Art & Auction. The feature concides with the opening of our fall exhibition, Irina Nakhova: Presence, on view through October 1. Presence features two new paintings by Nakhova, completed this summer, as well as important pieces like Mobius (1990) and Primary Colors 2 (2003), the latter of which was an inspiration for one of the rooms in the pavilion at the Venice Biennale.